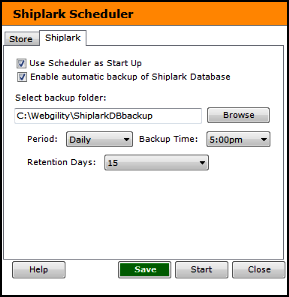 You can now use the Shiplark Settings tab on the Scheduler to perform a regular backup of the Shiplark Database or set up scheduler to auto start with Windows. • Use Scheduler as start-up - If selected, this option will make the scheduler auto start with Windows, whether Shiplark is running or not. • Enable automatic backup of Shiplark Database - If checked, you can take automatic backups in a folder of your choice. You can also copy these backup files (manually) to another location like a removable disk etc, for additional security. If required, this backup can be used to restore the Shiplark database to the date and time you took the backup. • Period - The frequency of the database backup can be specified here. • Backup Time - Here you can specify the time at which you want the backup to take place. • Retention Days - These are the number of days Shiplark will retain a backup file before deleting it.